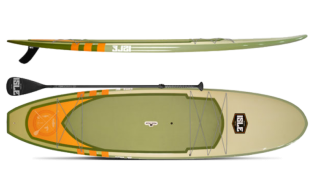 ISLE has a couple of stand up paddle boards that are suitable for fishing, but the 11'2 Sportsman is one that has been designed specifically for this hobby. Aimed at outdoor enthusiasts with a passion for fishing, this paddle board measures in at 11'2” and is 33” wide. It is also 5” thick and can handle a total capacity of about 300 lbs, which is fairly decent for its weight of 32.2 lbs. The Sportsman has a Kevlar timber composite construction, which means ISLE started with a lightweight precision cut EPS blank to which they then added a wood veneer reinforcement at the top and bottom to strengthen it. To increase durability and impact strength they then laminated the blank with fiberglass. For maximum rigidity, the Sportsman also features Kevlar Rails, which is a first for ISLE. They haven’t skimped on comfort either as this SUP features their soft brushed EVA traction pad. Designed to be non-abrasive and comfortable, the traction pad is something you’ll appreciate if you spend a long time on your feet while fishing from your board. Front and rear bungees can be found on the Sportsman, so all your extra gear can be kept secure, but also within easy reach. Anglers will also appreciate the center rail mounted i-Let’s, which makes it simple to add more bungees to the board or even strap down larger items like your tacklebox or cooler. Another feature of the Sportsman that is really nice is the gortex vent plug that is designed to be maintenance-free. Thanks to it, air can safely escape from the core of the board to ensure complete protection against delamination. Since temperatures can quickly rise during enclosed transport, or even sunny days on the water, this is a vital feature. ISLE has also included their patented LIFT SUP pop-out carry handle with this board. The flush handle not only has a comfortable, slide-out grip, but the military-grade handle grip material allows you to attach a sturdy cable lock to it to prevent theft. The Sportsman is not the cheapest stand up paddle board from ISLE Surf and SUP and their Sportsman Inflatable offers a bigger, yet lighter, alternative. However, for anglers who prefer a rigid board, the Kevlar Rails provide the Sportsman with a rigidity that is hard to beat. If you have more than enough space for storing a rigid stand up paddle board then the Sportsman will serve you well, but anyone looking for a more convenient experience along with compact storage, should consider the inflatable version instead.